NORSAR’s expertise in seismic instrumentation stems from a more than 40 years long history in operating one of the largest seismological observatories in the world. During the past 10 years, NORSAR has used and has extended this expertise to more engineering applications. This has not only led to innovative instrumental-based solutions in tackling societal problems, i.e., tunnel health monitoring using active seismics (THEAM), early train detection at railroad crossings (see Wavetrain Systems), but can also be applied for monitoring buildings and infrastructure facilities. With respect to the latter, the health monitoring of buildings of high priority (i.e., hospitals or schools) or infrastructure facilities (i.e., bridges, dams, masts) is of particular interest. Reasons for monitoring the vibration characteristics of the building can be, e.g., in the short-term to observe the structural behavior of a building during extreme natural hazards (i.e., earthquake, wind gusts, hurricane) or man-made impacts (i.e., explosions, accidents). In the long-term, a building’s deterioration due to age, extensive use, lack of maintenance, or design and construction flaws may also cause the monitoring of its integrity over a longer period of time. In case of the natural hazard earthquake, ensuring the safety and full operational status of critical structures and infrastructures is always one of the top priorities of a region in the aftermath of a larger event. Experience from past events has revealed that the detection of potential structural and non-structural damages and the thereby connected problems through visual inspections only is not sufficient. Therefore instrumental investigations are required in order to obtain an objective evaluation of the situation. 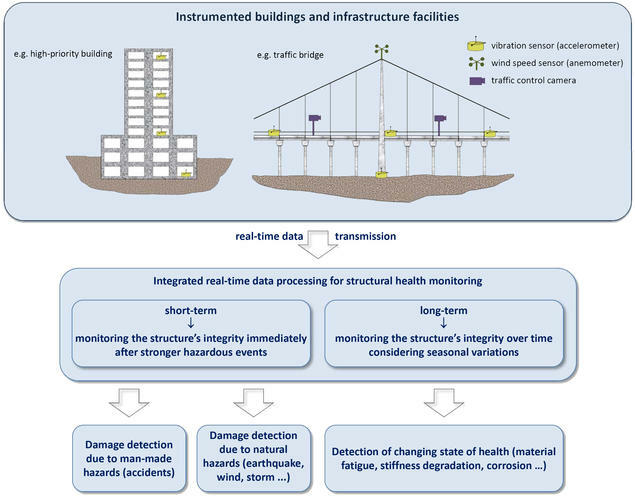 The Figure below illustrates the general concept of real-time health monitoring of buildings and infrastructure facilities. Especially in case of infrastructure facilities such as bridges, it is beneficial to monitor various sensors in parallel and to look for cross-references between the different data sources as there may be a strong connection between the bridge’s vibration characteristics and the measured wind speed or potential traffic accidents on the bridge deck that are monitored by vibration sensors and anemometers or traffic cameras, respectively. The data analysis of multiple sensors in parallel can thereby be used to check unusual data provided by a certain instrument and to get extraordinary events, i.e., accidents or natural hazard-related issues, confirmed.